When Apple introduced iOS 7 at last years’s WWDC, I posted some quick takes, including criticisms about the lack of customization and integration options. Obviously, Apple was listening 🙂 While iOS 8 may not give us everything in this regard, it certainly is taking steps in that direction. The new App Extensions in iOS 8 open the door to custom widgets, alternative keyboards, and App interactions. A big theme across WWDC this year was Adaptive although I haven’t seen this discussed much in the media. Everywhere you looked, Apple was talking about ensuring your apps are generalized for screen sizes, layouts, and orientation. Without going into too much technical detail, Apple’s system for introducing new screens has been somewhat weaker than Android. 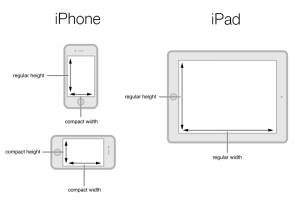 The original iPhone was 320 x 480 pixels and since then, they have piled various hacks on top of iOS to try and provide for different screen resolutions, aspect ratios, and sizes – but in the end, “320.0” leaks into apps to this day. To support the first retina iPhone 4 Apple introduced a simple scaling factor (2x), but when the iPhone 5 came out, it had a new aspect ratio and many apps didn’t handle it (black bars) and those apps had to be updated to handle the extra screen space. With iOS 8 Apple is introducing “size classes” and a new idiom called Traits. At first glance, to me the system looks oversimplified and not general enough for the long term, with only Compact and Regular definitions for width and height. It seems like what’s still lacking is any way to map into physical pixel density to know how much physical real estate an app is working with, or ie. whether a given object will be too small to see or ridiculously large. 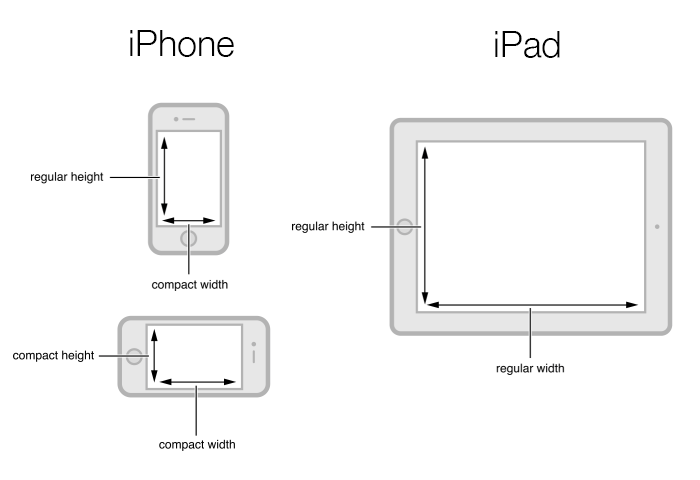 Anyway, in this new system, apps are no longer supposed to think about things in terms of orientation (landscape vs. portrait) but in terms of width and height being either Compact or Regular. I think everyone would assume that all this focus on Adaptive means new screen sizes and possibly new screen layouts (aspect ratios) are in the pipeline.